Home Amnesty ‘AMNESTY’ SENATOR MARCO RUBIO WEBSITE GOES LIVE! Is Senator Marco Rubio really a ‘DONOR CLASS PUPPET’? How can’t this be? Florida’s junior Senator, elected with a swell of Tea Party support in 2010 has become its pariah? Read on and check the mystery website. Senator Marco Rubio (R-FL) for his immigration positions ahead of the 2016 primaries has hit the web. At this time, it’s unclear who made the website—but it details in depth the immigration transgressions of Senator Rubio in a way that has yet to be done on the campaign trail. As 2016 GOP frontrunner billionaire Donald Trump marshals his forces to take on Rubio—the new Washington establishment candidate given that former Florida Gov. Jeb Bush’s campaign is floundering—this website could become a central part of the campaign. 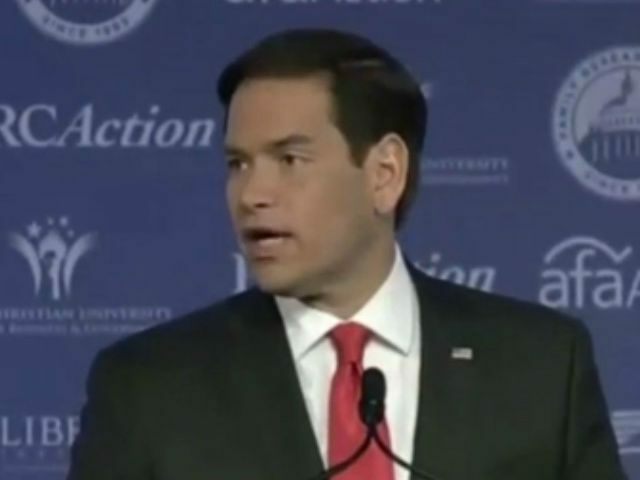 The URL for the site is RubioAmnestyPlan.Com, and could severely threaten to debunk Rubio’s efforts to claim again to conservatives just like he did before that his immigration viewpoint is not amnesty. “Rubio was hired to shove amnesty through the Senate by putting his face on Obama’s bill,” the site continues, citing the New Yorker and Twitchy. From there, the site cites Breitbart News, The Daily Caller, New York Times, ABC News, key immigration groups like FAIR and CIS and renowned blogger Mickey Kaus—who criticized Fox News for being too easy in coverage of amnesty—among several others to argue that Rubio during his “Gang of Eight” immigration days had launched a “24-7 Misinformation Campaign” for which he’s never apologized. “Rubio said he joined the Gang of Eight to ‘to get the best bill possible’ but he produced the most extreme immigration bill in history (more extreme than McCain-Kennedy) and written by special interest groups. Rubio’s plan earned the endorsement of Obama, La Raza, Reid, all Dems, Gutierrez, Pelosi, Zuckerberg, Murdoch, Iger, the Chamber of Commerce, and every open borders outfit in the country,” the site reads. It details how Rubio broke promises he made to nationally syndicated talk radio hosts Rush Limbaugh, Mark Levin and Sean Hannity and Fox News host Bill O’Reilly—again, for which he’s never apologized. “Rubio pledged to Rush Limbaugh that ‘if there is not language in this bill that guarantees that nothing else [i.e. the amnesty] will happen unless these enforcement mechanisms are in place, I won’t support it,’” the site reads. The site then goes through everything that was with the Rubio-Schumer “Gang of Eight” bill, and even shows a photograph of then Democratic Senate Majority Leader Harry Reid giving Rubio a big hug on the Senate floor as they celebrate the amnesty bill’s passage. Most importantly, perhaps, the site details how Rubio has “never changed his views” despite his campaign operatives giving off the impression that he has. 2016, amnesty, Legal Immigrants For America, LIFA, politics, Sen. Marco Rubio (R-FL), Senator Marco Rubio. Bookmark.